Recipe for Fitness: Champion Nutrition Recipe of the Week - Stuffed Chilies! 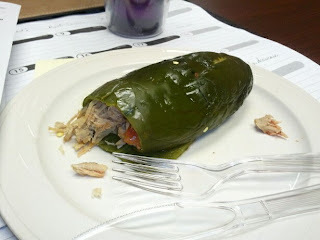 Champion Nutrition Recipe of the Week - Stuffed Chilies! Competition or Training diet can be really restrictive, and very repetitive. Very. Repetitive. While that's a good thing because it's simple and you don't have to put a lot of thought into your meals, it can definitely become boring. This recipe came out of my food boredom. If I had one more chicken breast drizzled with yellow mustard or sriracha sauce I just might start clucking. And then screaming. And then the men with the butterfly nets and long, long sleeved jackets would come for me. Hmmm. To avoid that not particularly stylish jacket, I decided to get creative. Note: chili peppers offer a ton of great nutritional benefits (Vitamins C, K, A, and capsaicin - a natural thermogenic). They're a natural fat burner - Score!! I had the hubby grill mine... just washed 'em and tossed 'em on the grill, turning often until the skin was bubbly. I allowed them to cool, then cut off the tops, scooped out the seeds and peeled off the charred skin and stored the peppers until I needed them. You can also cook them in the oven at 400 degrees, turning often. TIP: peel the skin off while the chilies are still warm. A) Crockpot Method - If you're bulk cooking your protein, this is the way to go! Place your meat in a crockpot with 1-2 cups low-sodium broth and a few sprinkles of Mrs Dash Garlic & Herb. Cook on high until meat shreds easily. Remove meat to a plate and using two forks, shred it up. You can shred all the meat, or just some of it. Store it in an airtight container, with the juices from the crockpot, for up to a week for use as needed. B) Rotisserie Chicken - Pick up a rotisserie chicken at the grocery store, then pull out the breasts and shred them. Mix the meat & salsa (and cheese if using) together, then gently stuff inside the chili pepper. You can either heat in the oven (350 for about 10-15 minutes) or in the microwave. 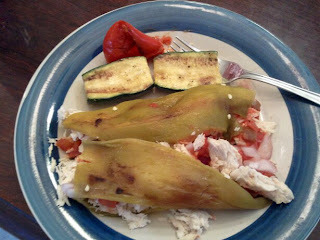 Mix in 2 Tbsp plain greek yogurt with the salsa and chicken. Sprinkle wheat germ and sharp cheddar (shredded) over tops of stuffed chilies and broil for 1 minute, or until cheese is melted and wheat germ is crispy. 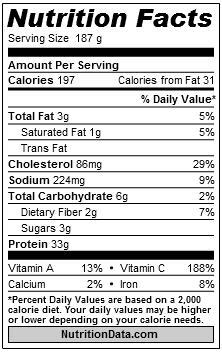 Nutrition Information per stuffed chili (made with crockpot chicken, 365 brand Roasted Chipotle salsa, and without cheese): 197 calories, 33g protein, 6g carbs, 3g fat. Lucky me I just picked up some Anaheim peppers and serrano and jalapeno today!